Joe Cortright is a Strong Towns member who runs the think tank and blog City Observatory. This post is republished from his site with permission. You can learn everything you need to know about transportation economics today, just by helping yourself to a free ice cream cone. 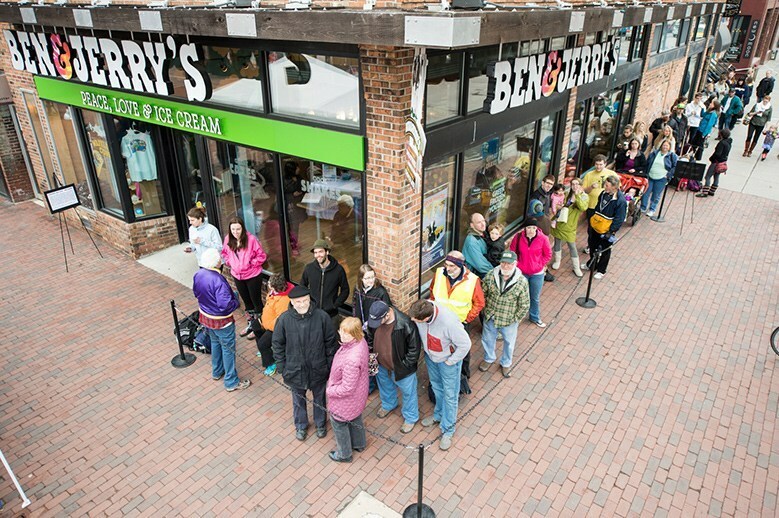 One day a year—April 9th—Ben and Jerry give away free ice cream to everyone who comes by their stores. Whether you’re hankering for Cherry Garcia or Chunky monkey, you can now get it for absolutely zero price. In addition to free ice cream, they’re also giving a free lesson in why American roads are perpetually clogged, and why state highway departments are (a) always broke, and (b) always think they need to build more and more and more lanes for traffic. Substitute “freeway” for “free cone” and you’ve got a pretty good description of how transportation economics works. When it comes to our road system, every rush hour is like free cone day at Ben and Jerry’s. The customers (drivers) are paying zero for their use of the limited capacity of the road system, and we’re rationing this valuable product based on people’s willingness to tolerate delays (with the result that lots of people who don’t attach a particularly high value to their time are slowing down things for everyone). April 10th every year, Ben and Jerry go back to charging for ice cream. And the lines at their stores disappear. In another year or two, Manhattan will be doing pretty much the same thing, when it starts charging a price for private vehicles entering Manhattan. Road pricing can get rid of the lines of cars in New York City just as effectively as it does in front of ice cream shops. If you can’t justify your half-a-billion-dollar freeway widening project with the usual argument, why not try a different one: that it will reduce crashes? Unfortunately, there’s no evidence for this either.